Christopher Zito’s “The Mollu” is a four-paged D&D 5e supplement from the DMs Guild that only costs a Dollar. It has a specific and unusual use, though, which is to introduce human-sized slugs and snails as player character races. 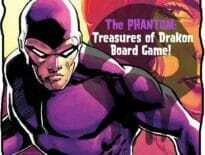 D&D already has an interesting collection of anthropomorphic player character races including the Aarakocra and Kenku birdfolk, Lizardfolk, the feline Tabaxi, the turtlefolk of the Tortle and the elephant-like Loxodon introduced officially to the game via the Guildmasters’ Guide to Ravinca. The Mollu aren’t an official race but they’re certainly a quirky one. The Mollu originate from the glades of elven forests in which trees fall and decay only to become nourishment for other creatures. When these trees contain magic, fey or otherwise, then it may sometimes have an effect on those who eat it. Over time The Mollu may emerge. Zito describes a kind and gentle-race, relentlessly thoughtful and considerate but able to adapt to the violence of the outside world when necessary. The Mollu are hermaphroditic in nature and so tend towards unisex names such as Alexis, Jassin and Indigo. They’re slow (-2 to Dex) but strong thanks to bodies made from huge muscles (+2 Str) and can live 800 to 1,000 years. 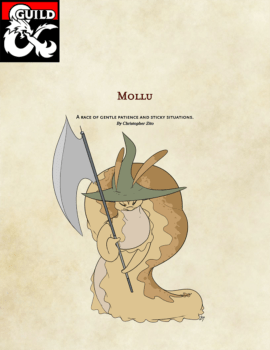 The D&D 5e supplement sets out four different types of Mollu. There’s the Shield type, cavern and mountain Mollu with a shell on their back, the Terrestrial Mollu who are especially wise and durable, the Sea Mollu who are smart and poisonous and the Pillow Mollu who can change colour.